Thomas Jackson was born in Clarksburg around midnight on the evening of January 20, 1824. He was raised by an uncle at Jackson’s Mill in Lewis County and then attended the U.S. Military Academy at West Point. Jackson spent the next 10 years teaching philosophy and artillery at the Virginia Military Institute. He fought gallantly during the Mexican War but resigned from the army after the war. He spent the next 10 years teaching philosophy and artillery at the Virginia Military Institute. 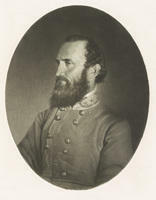 At the beginning of the Civil War, Virginia seceded from the Union, and Jackson was appointed a Confederate brigadier general. At Harpers Ferry, he oversaw the transfer of equipment from the former U.S. armory to the South. Weeks later, he earned the nickname “Stonewall” for his valor during the Battle of First Manassas. The next year, his lightning-quick troop movements in the Shenandoah Valley Campaign made military history. As Robert E. Lee’s top general, he also played key roles in Confederate victories at Cedar Mountain, Second Manassas, and Fredericksburg. His brilliant military career ended abruptly at the Battle of Chancellorsville, when he was accidentally shot by his own troops. “Stonewall” Jackson died on May 10, 1863, at the age of 39.